Do you have teenage children? I do, I have two. And though I hate that they are grown already and soon ready to leave me, i do enjoy the fact that they are driving on their own. It has truly been a blessing having my daughter drive herself and her brother to school and run errands for me. And run errands, she does… every day. 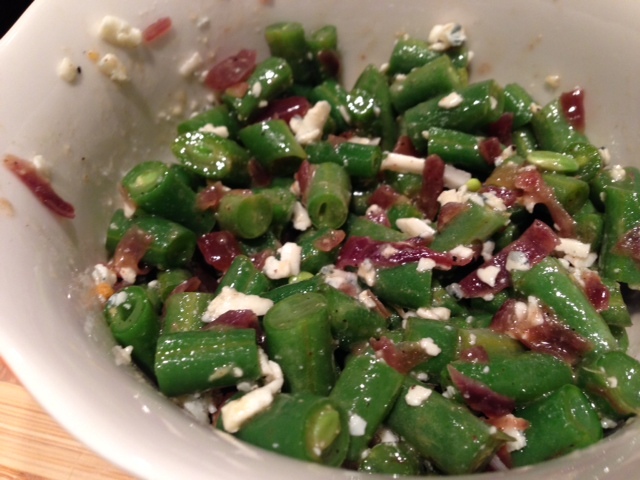 The other day i sent her to get some French green beans for a cooking class and in spite of finding some, she bought some regular green beans, not quite the same taste, or texture. 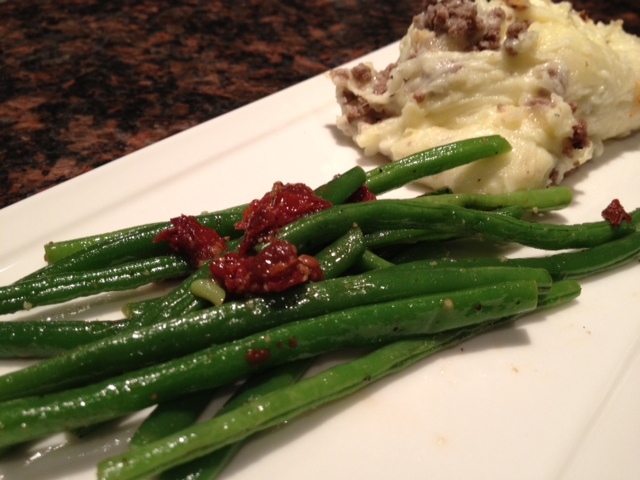 I cooked them the same way I would have my French green beans, but i was not too too satisfied. Any way, we cooked them, we ate them and there were gone. Because I had another bag in the fridge, i decided to fix a salad with them. 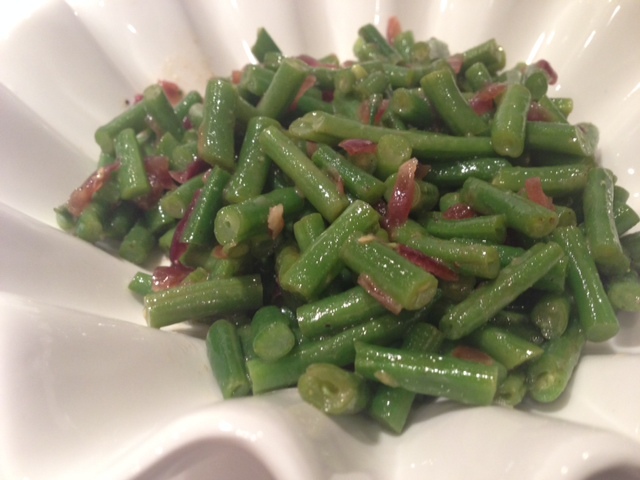 Growing up in France, we often had green beans salad with fresh sliced onions. I never was fond of it, that is why I decided that i could use cooked onions instead. I also added maple syrup to my vinaigrette to sweeten the taste of the vinaigrette = Bingo;-) I loved, loved, loved it. I hope that you will give it a try. 1 small onion or 1/2 of a large onion to make 1/4 cup of caramelized onions. Drop 1-2 tbsp of olive oil into a large frying pan and heat it up until it is starting to sizzle. Add the chopped onion and saute it for a few minutes stirring constantly. Reduce the heat and continue cooking the onions until they are becoming an amber color. It will take at least 8-10 minutes. Sprinkle a bit of salt and pepper, stir and set aside to cool. 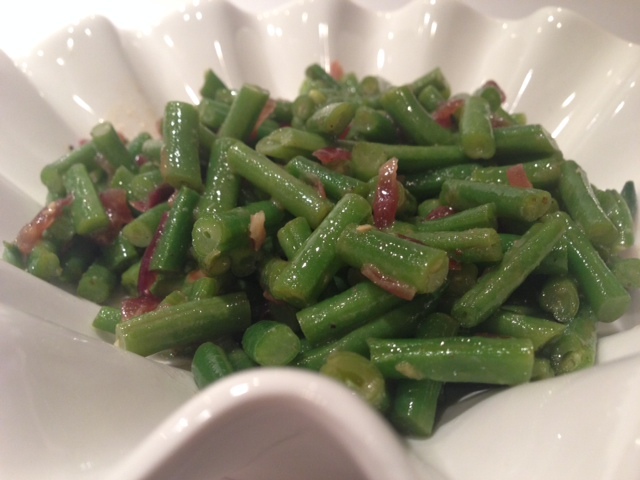 Rinse the green beans, trim the ends and place them in the round mold. Place the octogonal silpat on the large round mold. Place the round mold on the microwave and cook it for 4 minutes. When the beans are cooked, let them cool. Cut them in 1/2 inch. In a large bowl, mix all the ingredients to make the dressing ( oil, olive oil, salt, pepper, maple, mustard). Add the cut beans and the caramelized onions and mix well. You may add 1/4 cup of toasted pecans, 1/4 cup of gorgonzola cheese crumbled, and 1/4 cup of cranberries ( that you would have previously soaked in water for 2 minutes) for extra flavor and for variation. Well, i have to say that this salad was a winner at my table, even my son and husband went for second. Yeah!!!! And I have enjoyed it so much myself that I have been eating it for dinner and lunch these past 2 days. 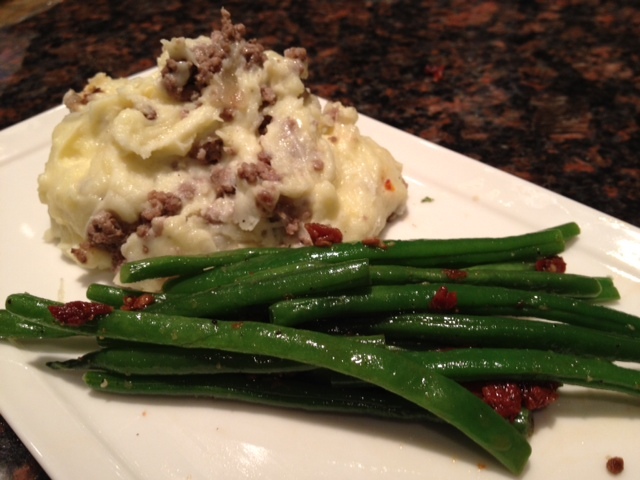 I know that i will be serving it for Thanksgiving, easy fast and still yummy;-) I hope that you will give it a try. The first time I ordered a salad as an appetizer here in the USA, I was a bit surprised to see all the things that was included. There was cheese, various vegetables, nuts, even meat amid the greeny leaves. In France, when you order a green salad as an appetizer, it is usually a very plain salad. It does not include many vegetables. I think the reason is because a salad is usually eaten as a ” cleanser” between the main meal and the cheese/ or dessert. When we eat generous salads such as those we know here in the USA ( Chef SAlad), they are replacing a meal. Those salads are found on lunch menus in the summer, and they rarely have lettuce as their main base. There are two popular salad that you will see on menus in the summer: Salade composee which often has rice as its main base, and salade nicoise that is made with steamed potatoes, steamed green beans, fresh onions and tomatoes. There are millions of recipes out-there, but the traditional one includes red purple onions, artichokes, anchovies, eggs and tuna. Growing up, it seemed that when we had left-over potatoes, this is what my mom made. I will tell you that I ate so much of it that it took me a while to make it again. But tonite since I had small quantities of everything, it occured to me that I could make a warm salade nicoise for my dinner with what i had in my fridge. 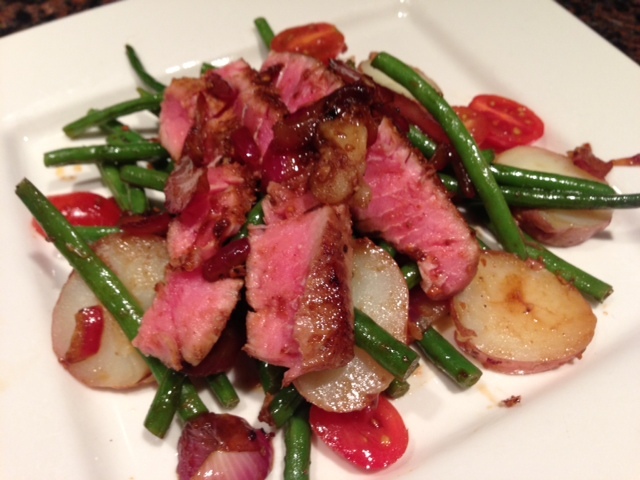 The French Salade Nicoise is seasoned with a traditional red white vinaigrette but I gave it my twist. 1/2 purple onions sliced very thinly. 2-3 tsp of smokehouse maple herb mix from Costco. 1/4. tsp of sea salt. Rinse the potatoes very well and place them in the large round mold. Add a dash of salt, and a tsp of water. 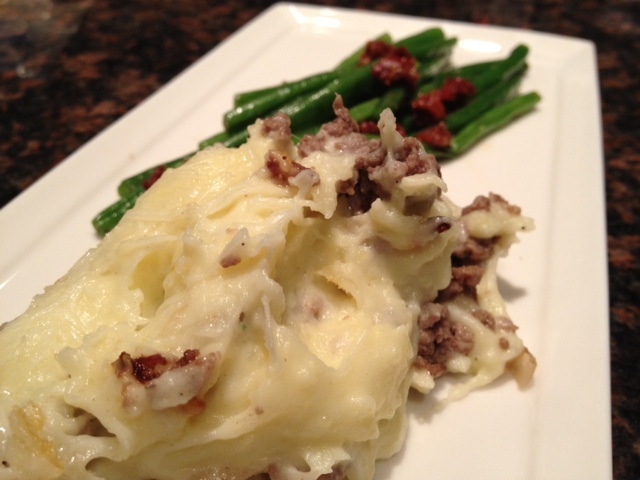 Cover the round mold and cook in the microwave for 6-8 minutes or until the potatoes are cooked but still firm. Let the potatoes cool and then slice them in narrow slices. Set aside. 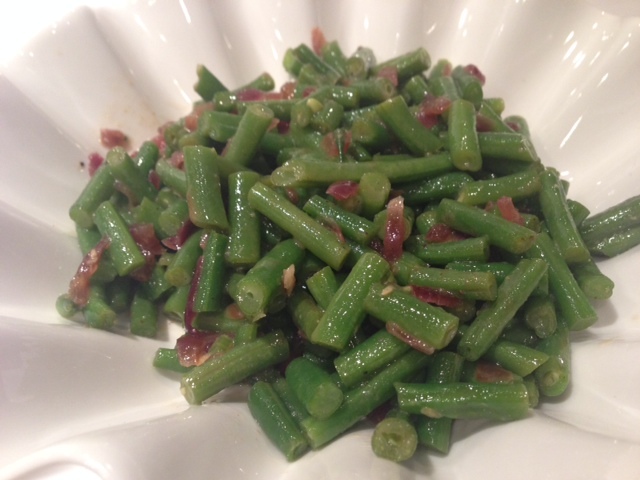 Then place about 2 cups of green beans or haricots verts in the round mold, cover the round mold again with the octogonal silpat and cook for 5 minutes. Set the beans aside. 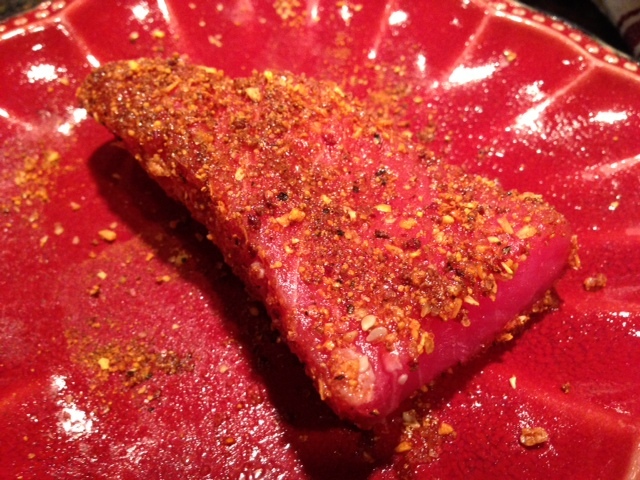 On a plate, sprinkle about 2 tbsp of the maple and lay the tuna into the smokehouse maple seasoning so that it will be covered with the spice. Repeat this process on all sides. Place a small frying pan on a hot stove at medium-high, and add 1/2 tbsp of butter. 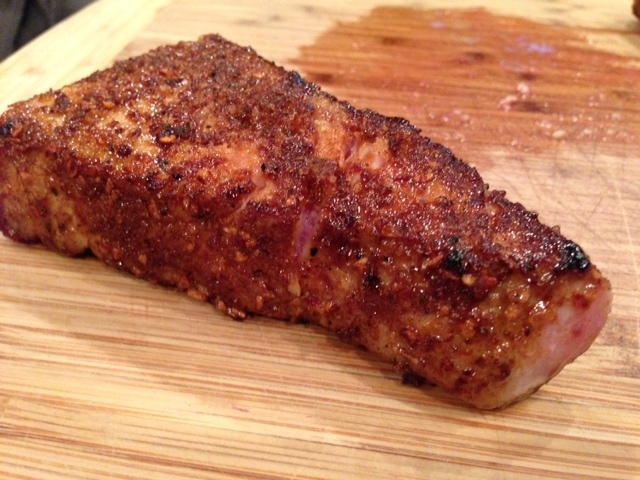 When the butter is sizzling, add the tuna steak and sear it for 1 minute. Season with some salt. Turn it over and repeat so as to sear all sides. Remove the tuna from the pan and set it aside. In the same frying pan, add the sliced onions and cook them until they are becoming a golden brown. Throw in the pan the balsamic vinegar, the olive oil and 1 tbsp of the maple seasoning, and bring to boil. 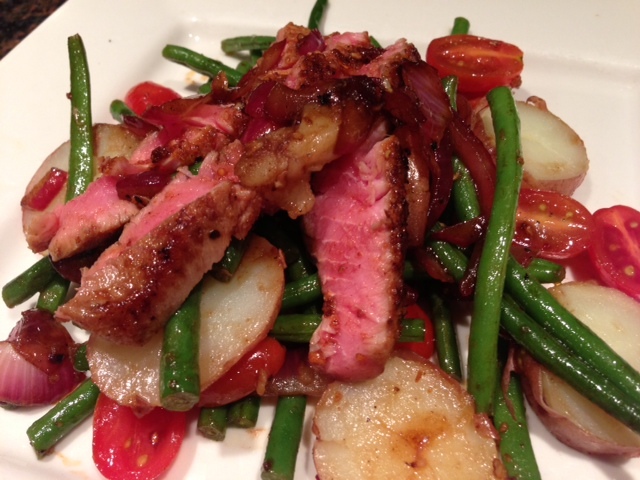 Turn the heat down to low, add the sliced potatoes, the beans, the fresh tomatoes and stir. Cook this mixture for only 1 minute or 2. Add 1/2 tsp of sea salt. Toss. Plate the “salad” on plates. Slice the tuna in narrow slices, lay them over the salad. Drizzle more sauces over the tuna, et voila!! !